Opened on August 1, 1950, the UST-Education High School is an institution founded by the Dominican fathers during the time of Rector Magnificus Very Rev. Fr. Dr. Angel de Blas, O.P., to provide academically gifted but financially challenged students a chance to acquire quality, Catholic education without having to shoulder the usual cost stipulated in other academic institutions. Also, the UST-EHS serves as the training ground for the College of Education’s Bachelor of Secondary Education fourth-year students. Doña Caridad Zialcita-Sevilla served as the first Principal of the school, when it was opened 59 years ago. Making up the team of faculty members were professors from the college, who served as both Critic and Regular Teachers for the different subject areas. The school accommodated first, second and third-year students during its inaugural year (1950-1951), with the very first batch graduating in 1952. During its first 16 years, the UST-EHS was located in a wooden building near the Dapitan Gate, where the Thomas Aquinas Research Complex now stands. It was in this building that the seeds were sown for the EHS that has now become. Organizations like the Knights of Jesus, the Rondalla, and other student organizations were instituted. The Scouting Movement was officially organized in 1951, and soon became one of the crown-jewel groups of the EHS, especially when UST-EHS became the Training Center of the BSP-Manila Council & Advancement Seminars Center. In 1966, the school transferred to a pair of one-storey buildings, then known as the Normal Building, in front of the UST Clinic, near the Forbes (now A.H. Lacson Gate). A few years later, the school transferred to its present site, the Education/Albertus Magnus Building. In the 1970s, a new educational system was instituted: the Individualized Instruction System, more popularly known as the Pilot-Regular system or the Personalized Education System, under the Principalship of Mrs. Gloria Zamora-Hernandez. It was during this decade, the 1970s, that the UST-EHS had its biggest student population, with each batch averaging around 200+ graduates. In later years, during the 1980s, the co-educational school system was adopted, reducing the considerably the student population of the EHS. Never one to not flourish outside the University, the EHS shone in national exams like the NSAT, especially during the 1990s. 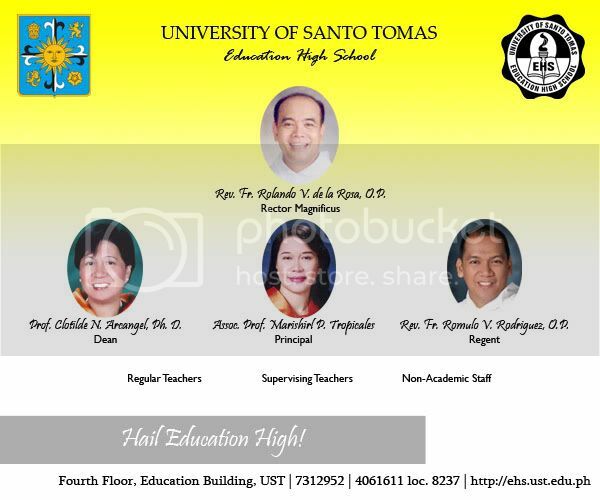 In the school year 2002-2003, the Education High School accommodated its first batch of students who no longer followed the Individualized Instruction System, whose final batch came with the Class of 2005. For the past 59 years, the EHS has been under the stewardship of a total of 10 Rectors, 16 Principals/Officers-in-Charge and 18 Spiritual Directors/Regents. Thrice have the names of the sections been changed: from the A, B & C to E, H & S, then from E, H & S to Pilot and Regular, then to the current set of names, the EHS core values. With the recent inclusion of Class 2009 to the alumni roster, EHS alumni amount to close to 7,500 graduates, proudly carrying the name of our alma mater. Presently, the EHS is a home to an average of 400+ students, divided into 8 sections named after the core values the EHS endeavors to exemplify: piety, responsibility, simplicity, honesty, justice, dignity, patriotism and respect. Next year, the UST-EHS will be celebrating jubilantly its 60TH Foundation Year, an occasion that will highlight and showcase the glorious history of an institution that served at one time or another as the stage where the Batang Eduk or EHSians flourished.